A Windows application for the second generation of Token2 programmable tokens. miniOTP-2, OTPC-P1, C300 and a number of others (to be announced soon) are now possible to be programmed and synced not only using an Android app but also a Windows application. Windows application will require an external USB NFC reader (which will be available to be ordered on our online shop) or a built-in NFC module (existing on some models of modern laptops). So far the application has only been tested under Windows 10 and Windows 8 64 bit. You should start by downloading the package and extracting to a folder on your hard drive. Token2 Burner app for Windows does not need to be installed, it can be launched as a standalone executable file. Follow the steps below to perform setting the seed for your token. 1. Launch the exe file, then select the NFC device from the drop-down list and click on "Connect". You should see a message box notifying about a successful operation. 2. Enter the seed (in base32 format) or click on "random" button to generate a random seed. 3. 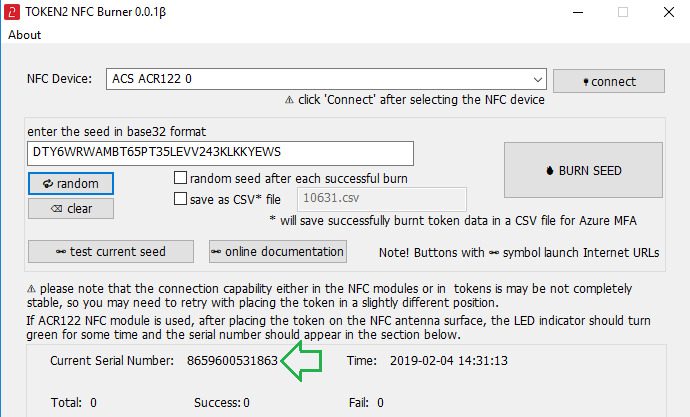 Place the token onto the NFC module and wait for its serial number to appear. 3. Click on "Burn seed" button. A log entry with the serial number and "Successful operation" text will be logged in the log window. Follow the steps below to perform setting the time of the token. Please note that C300 model does not support this feature. Furthermore, the token models with "Restricted" time sync feature will have to be reseeded after this operation. Check the specifications of the token model before syncing the time. 2. Place the token onto the NFC module and wait for its serial number to appear. 3. Set the time in the format as shown on the example below. You can use the current system time of the PC the burner application is running on by clicking on "current time" button. Click on "Set time" to start the process. "Time has been adjusted" message will be displayed upon successful operation. Some devices (including ACR122 USB module) may have issues with NFC link stability, so please be patient when performing these operations. Read this article explaining the NFC link stability issues.